The motherboard is the main circuit board in a computer. It serves to connect all of the parts of a computer together. It provides the electrical connections by which the other components of the system communicate. It contains the CPU, BIOS, memory, mass storage interfaces, serial and parallel ports, expansion slots, and all the controllers required to control standard peripheral devices, such as the display screen, keyboard, and disk drive. It is a computer’s central communications backbone connectivity point, through which all components and external peripherals connect. The motherboard is the piece of computer hardware that can be thought of as the “backbone” of the PC. It is (sometimes alternatively known as the mainboard, system board, baseboard, planar board or logic board. 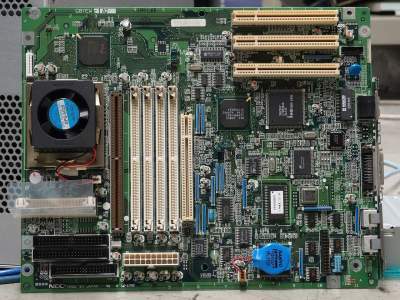 What was the first motherboard? The first motherboard is considered to be one used in the IBM Personal Computer, released in 1981. At the time, IBM referred to it as a “planar” instead of a motherboard. The IBM Personal Computer and the motherboard inside it would set the standard for IBM-compatible computer hardware going forward. Phones, tablets and other small devices have motherboards too but they’re often called logic boards instead. A typical desktop computer has its microprocessor, main memory, and other essential components connected to the it.